Seven years experience as a high performance language teacher and supervisor who successfully managed projects such as Summer Teachers' workshops, High School Students Preparation Exams and contribute greatly to the success of reforming the English curriculum for public schools in Osaka Japan. An experience educator highly organized and can multi task in a fast paced work environment, have the ability to produce innovative ideas and execute them accordingly. Skilled community organizer capable of fostering positive relationships with clients and colleagues. Experience Christian missionary preacher and evangelist who serve as a volunteer counselor for drug addicts and homeless people in Osaka Japan for many years, effective in both written and spoken communication in four languages. 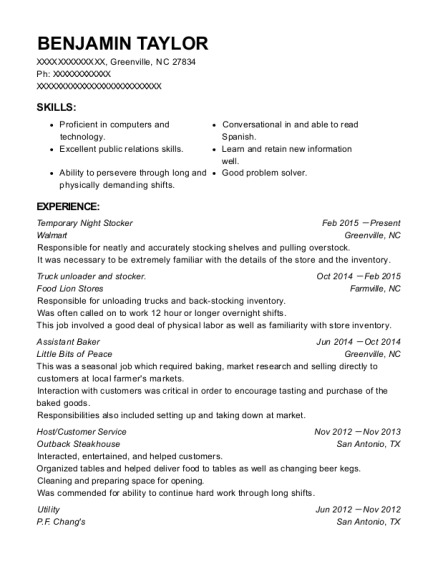 Posses excellent problem solving skills and a team player competent in conflict resolution. Look out for any potential threats like shop lifting and arm robbery in the store. Strategic resource planner to create new ideas, lesson plans and teaching English as a second language at public elementary and junior high schools. Coach and supervised students in the classroom and during field trips. Counsel trouble students during and after school hours. Provide technical support training new teachers to adapt to Japanese working environment. Recruit and interview new candidates for new teaching positions. Presenter and lesson demonstrator for the board of education. Create a monthly work schedules for substitute teachers. Counselor for young couples as they prepare for their wedding ceremonies. Conduct Christian wedding ceremonies at hotels and wedding chapel in Kyoto and Osaka. Outreach coordinator to the homeless people and orphanage kids. Volunteer helper for the local church and community. Bachelor of Arts: Christian Education 2015 Freedom Bible College & Seminary - Siloam Springs, AR Continuing my education pursuing a Bachelor of Arts in Christian Education degree (BACE) at Freedom Bible College & Seminary and will graduate in 2016. Associate of Arts: Christian Ministries 1995 University of the Nations-Kona Campus - Kailua-Kona, HI Completed and Graduated from the Biblical Leadership school & the school of Frontier Missions at University of the Nations campus. Also completed a six months field study of world evangelism in cape Town South Africa as part of both schools. Associate of Science: Early Childhood Education 1987 Samoa Teachers' College - Apia Samoa, SA Graduated with a teaching certificate and worked as a middle school teacher for two years in Samoa. 12 years served as a Christian missionary with Youth With A Mission International in Japan and Africa. 8 years as a counselor and outreach coordinator for the homeless in Osaka Japan. Also a helper and driver for the Kyoto food bank and pastor for Kyoto Northern church during those years. 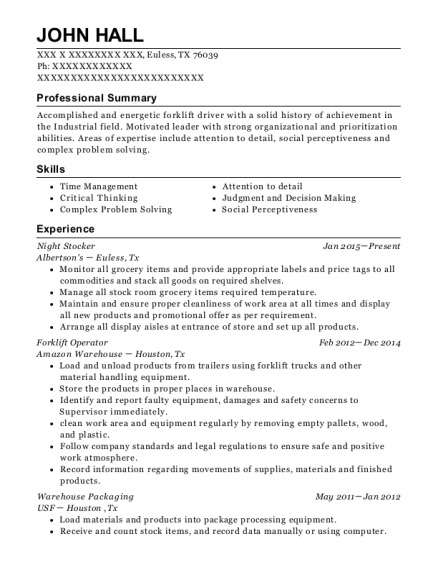 This is a resume for a Night stocker in Alexandria, Virginia with experience working for such companies as WalMart and FedEx. 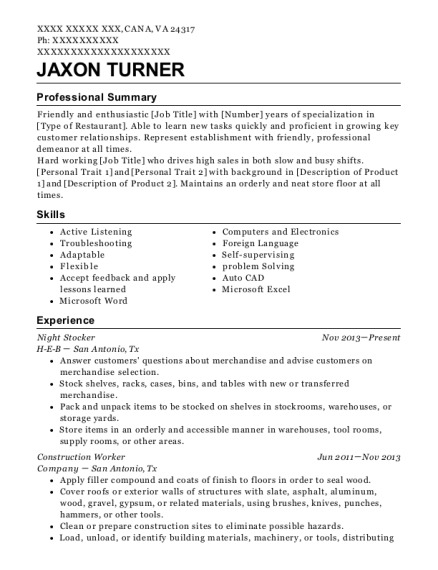 The grade for this resume is 0 and is one of hundreds of Night stocker resumes available on our site for free. 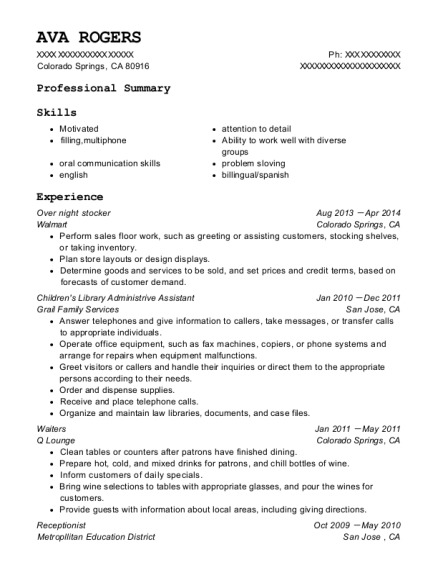 Use these resumes as templates to get help creating the best Night stocker resume.